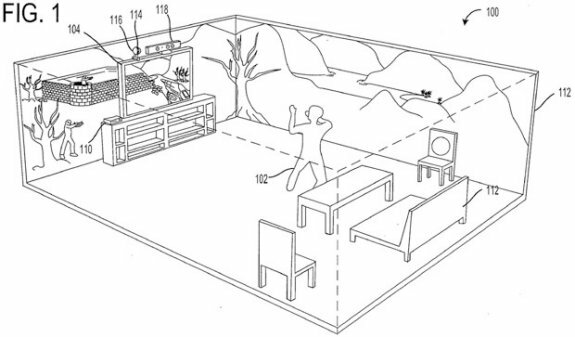 News hit the wire that Microsoft tried to patent a holodeck-like gaming experience in early 2011. The company filed a patent application for an "immersive display experience" that combines primary and peripheral images to give gamers a better sense of their environment. A projector is used to display the peripheral image, which is not designed to be the focus of the gamer's attention, but to provide a more immersive gaming experience. The application explains the relationship between the primary image, the peripheral image, and a depth camera that tracks the position of the user. The peripheral image is derived from the primary one, with corrective distortion applied based on the user's perspective, the topography of the room, and even the color of the walls and upholstery. A projector is tasked with displaying the peripheral image, which will have a lower resolution than the primary one. Rather than being the focus of the user's attention, the peripheral image is designed to provide environmental awareness. As I've discovered using triple-screen surround gaming configs, even limited peripheral vision can enhance the gaming experience greatly. The lower-resolution image shouldn't be an issue, since the player's attention will be focused on the primary display.